Goodreads Synopsis: Where do you go when nowhere is safe? Sixteen years after a deadly virus wiped out most of Earth's population, the world is a perilous place. Eighteen-year-old Eve has never been beyond the heavily guarded perimeter of her school, where she and two hundred other orphaned girls have been promised a future as the teachers and artists of the New America. But the night before graduation, Eve learns the shocking truth about her school's real purpose--and the horrifying fate that awaits her. In this epic new series, Anna Carey imagines a future that is both beautiful and terrifying. 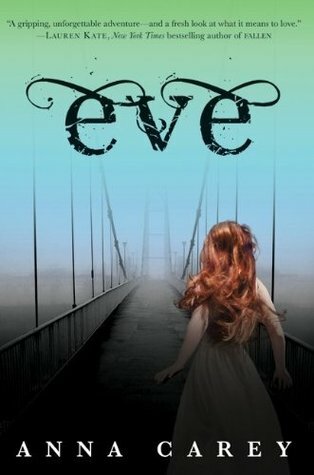 Readers will revel in "Eve"'s timeless story of forbidden love and extraordinary adventure. Tagline: "Where do you go when nowhere is safe?" I liked Eve a lot. She was quirky, made me laugh at times, and she was the type of person you would so want to meet! Her innocents made me laugh and cry and she made the book so much fun to read! :) She lives at the School where the girls are kept to learn all the things a women needs to know. They tell her never to go out the School, because of the men, they growed to fear and hate. Eve starts to question why she here and in the middle of her biggest night, graduation, a girl named Arden escapes. Eve is in complete shock it more like someone doing something weird and our reaction is similar to Eve. I have not read this, but your enthusiasm makes me want to try it!